Welcome to our Successful Adoptions page. If you've adopted a dog from us, please send us a picture and an update and we'll create a little Web page for him/her. We're still adding pictures that we've scanned in, so if you don't see your dog, please bear with us. Feel free to send corrections or additions to Webmaster@saveadog.org. For a while, the software that has handled our success stories was broken. We've recently fixed the software and are catching up on the backlog of success stories we've received. Our most recently updated success stories can be found on this page. If you are looking for a success story that you know was previously posted on our website, It's probably in our Success Story Archive. 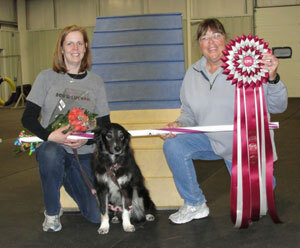 Congratulations to Marjorie Otterson and Lily, who completed thier CPE C-ATE (CPE Agility Team Extraordinaire) championship on Saturday, March 27th, 2010. Not bad for a duo that started agility "just for fun". Lily was rescued by Save A Dog from a Shelter in North Carolina, and adopted by Marjorie in August of 2003. Former Save A Dog littermates Maggie Athan, of Wayland, MA and Bella Carnahan of Marlboro, MA recently reunited for a play date at the training ring at Especially for Pets in Sudbury. 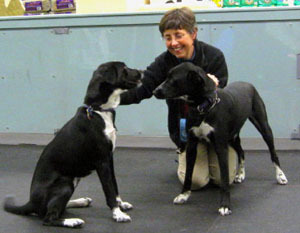 "Both dogs hit it right off and had a great time playing," says Betsy Athan, Maggie's adopter.